Vincenzo Coronelli made the globe in 1690 while he was in the employ of Louis XIV of France. Coronelli's work includes more than 100 large and small globes that have survived, several hundred maps, printed separately and as parts of atlases. 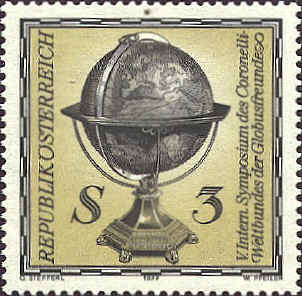 The stamp was issued in 1977 for the Fifth International Symposium of the Coronelli World Federation of Friends of the Globe in Austria. Three elements make up the design of the stamp: images of the two globes, and an enlarged part of the celestial globe. The portion of the terrestrial globe that is shown is Ameriq and Mer de Nort Ocean Occidental, America and The North, Western Sea. The celestial globe seems to be centered on Sagittarius, the Archer, and the Corona Australis, the Southern Crown. At the top of the stamp is a picture of one of the constellations from the celestial globe, La Grue (Grus, GERANOS), The Crane. (The name is also give in Arabic.) This constellation was invented by Peter Dirksz Keyser and Fredrich Houtman between 1595 and 1597, although it was probably known much earlier. It is very likely that it represents an astronomer from Egypt, as the Crane was the symbol of that office. The Arabs included the stars of this constellation with the Southern Fish. The constellation is visible from July to September in latitudes south of 33°N.